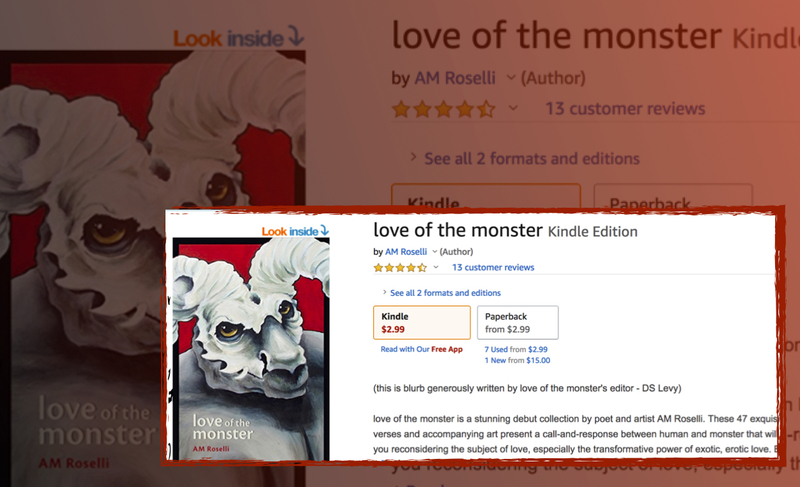 This entry was posted in My Art & Writing and tagged advertising, Amazon, art, collection, ebook, illustratiion, kindle, love, monsters, poetry, print, promoting, writing. Bookmark the permalink. I’ll buy them all from you! Don’t get down Love Of The Monster is an awesome book. People may give it a cult following. Don’t get on yourself for trying and if you don’t get the results just keep trying. I loved all your work and I am not the only one. Go for your dreams always AnnMarie! Beautiful woman Beautiful talent Beautiful book! I want to read the book. Never give-up. Us, who love to write. We must. You did well. You have written and published a book. Peddle those book, to make your mother smile in heaven. Answer: Because you’re a writer. Dammit, AM, that last graph is a tear-jerker, a palpable, tender sadness. I can see you and Millie wandering about the HV selling your books, talking to folks. I know she’d be your best bookseller. Who knows that it still can’t happen—but maybe in another way you just can’t imagine.